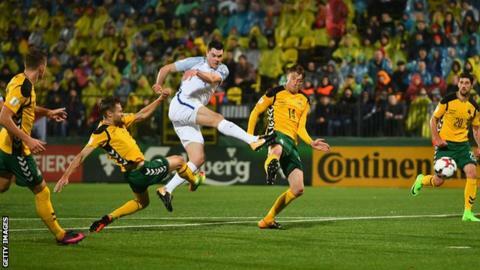 Everton defender Michael Keane says last season's difficult campaign left him reluctant to leave the house. Keane, who has four international caps, has been called into the England squad by manager Gareth Southgate for the first time in more than a year. The 25-year-old joined the Toffees for £25m in July 2017, but struggled for form as the club went through three managers in his first season. "When you've had a bad game, you don't want to go out for dinner," said Keane. "I've never been out when people have shouted abuse at me. But there were a few months when things were going really badly and I did not really want to go and do things out of the house." Keane has made the England squad for their next two matches, both at Wembley, against the United States in a friendly on Thursday, and Croatia in the Nations League on Sunday. The centre-back, who made his England debut in the 1-0 defeat by Germany in March 2017, last appeared for his country against Lithuania in October 2017. His recall has come after a difficult early spell at Everton in the wake of his transfer from Burnley. Keane was signed by Dutchman Ronald Koeman, who was sacked in October 2017 and replaced on a caretaker basis by David Unsworth, the club's Under-23s coach. Former England boss Sam Allardyce agreed in late November to take charge, leading the Merseyside club to an eighth-placed league finish before leaving in May this year. Keane said: "It is really sad when managers get sacked and they talk to you for the last time and you see how visibly upset they are. "That gets to you and makes you feel guilty and you want to make sure it does not happen again. We had three managers in the end and it was difficult: All the change constantly happening. "Although it wasn't a great year, I took a lot from it. "I learned a lot about myself. I'm probably mentally stronger and developed that thick skin because a lot gets said about you when things aren't going well. "You've just got to learn to deal with it and try to not let it affect you and that's something I can take from it. Now I can sit here in the England camp and says I've come through that."